Starting his career in the Scottish junior ranks with Slateford Athletic, Edina Hearts and Armadale Thistle, Tommy signed provisionally with Hibs before heading to Bo'ness. During this time he contracted tuberculosis but was lucky enough to fully recovered and continue his playing career. Whilst completing his apprenticeship as a bookbinder, he signed for English Third Division side Colchester United at the age of 21 and was a first team regular over the next two years. Following the tragic death of his young son, Tommy returned to Scotland in January 1962, and was offered training facilities by United. Just over a month later he signed a contract at Tannadice, and made his United debut at inside right against Motherwell in March 1962 and remained in that position for the rest of the season. He was soon back in his more familiar right back position and was rarely out of the United line-up over the next six seasons. 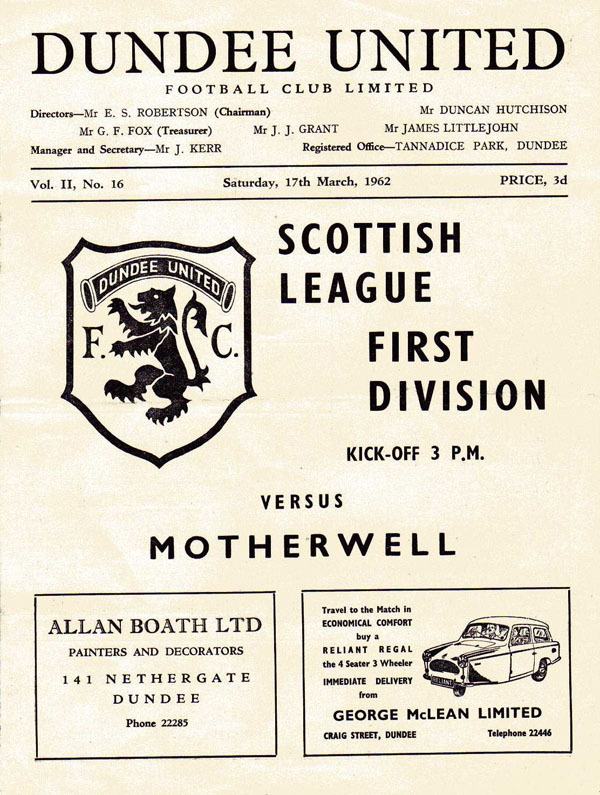 During that time Jerry Kerr's side not only solidified their position in the top flight, they also reached the semi-finals of the Scottish Cup for the first time in 1963, and their first League Cup semi-final in 1964. In the summer of 1965, he played in all ten matches as United reached the final of the short-lived Summer Cup competition, collecting a runners-up medal. Having finished in 5th place in Division One at the end of the 1965/66 season, the club's highest ever league position as the club qualified for European football for the first time. Prior to United's first venture into Europe, United rejected a £10,000 bid for Millar from Billy Shankly's Liverpool, and the defender decided to only sign a part-time contract with the club and took a job working in a local printers. He was then part of the side that famously recorded home and away wins over Spanish giants, Barcelona. Unfortunately for Tommy, he lost his job as a result of taking time off to play in the away leg at the Nou Camp! Thankfully United then took him on full-time again, and could later travel with the team to Italy to face Juventus in the next round, as well as to the United States as the side represented Dallas Tornado in the United Soccer Association. In season 1967-68 Tommy was joined at United by his older brother Jimmy, who had been released after a successful spell with Rangers. The brothers played together on at least a dozen occasions, however injuries prevented that that number being higher. In February 1968 Tommy was stretchered off with a broken leg in the classic 5-6 Scottish Cup match with Hearts at Tannadice, an injury that marked the beginning of the end of Tommy's time at United. Out for nine months, he returned to the side for a while in October 1968 but he was released in May 1969. He then joined Cowdenbeath where he collected a Second Division runners-up medal in 1970, and later played with Berwick Rangers and Hamilton Academical before retiring in 1971. In 2014, he was posthumously inducted in to the Dundee United Hall of Fame. Tommy was born on this date in Edinburgh.